This book is a prime example of today’s anemic Christianity trying to walk in every way except by the Word of God. 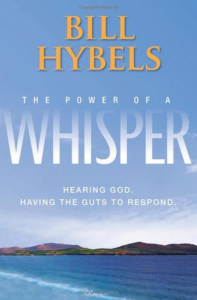 Hybels gives a detailed history of his own ministry and how (he believes) God talked to him through “whispers” all along the way. This is not just the usual “I believe God was saying” statement that many have used, but that he heard “syllable by syllable” (p. 158). Hybels led his church to have women ministers because God whispered to him that he should do it (p. 151). He also speaks highly of God whispering through mother Teresa and Oprah and claims that even Jesus needed whispers from God. He says God whispered to him that all children on earth were His “kids” (p. 225). Rated GG (“Good Grief”).